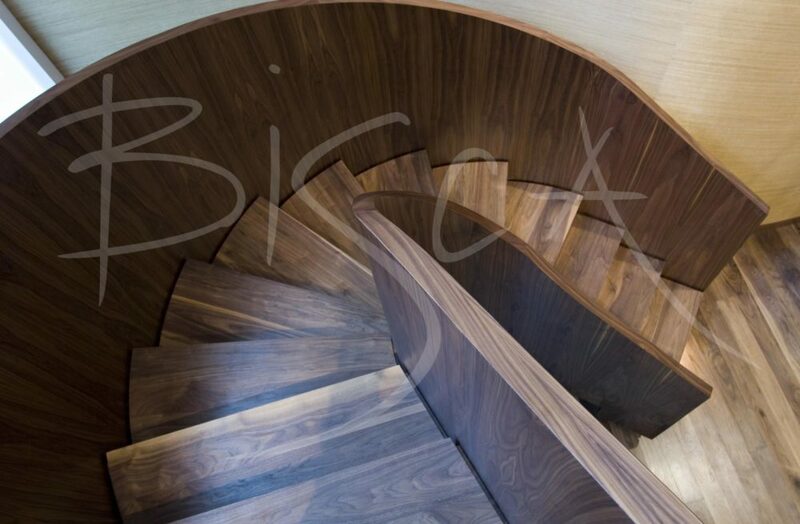 Helical Staircase of Walnut Veneer. 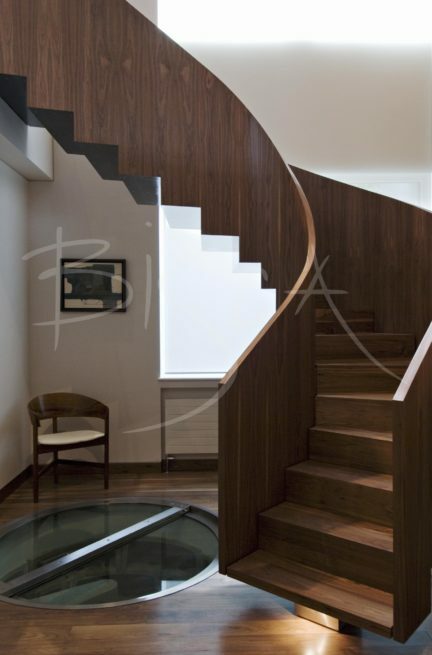 A distinctive walnut veneered staircase, designed for a property in Central London. Continuous treads and risers of walnut set within timber veneer clad balustrade, sweep down from first to ground. A striking saw-tooth bottom edge contrasts against the pale walls. The challenge was the position of the existing wine cellar hatch opening. As part of the design, we replaced the hatch with a flush, glass swivel unit for ease of access. For more about this stair design, please quote 2073. 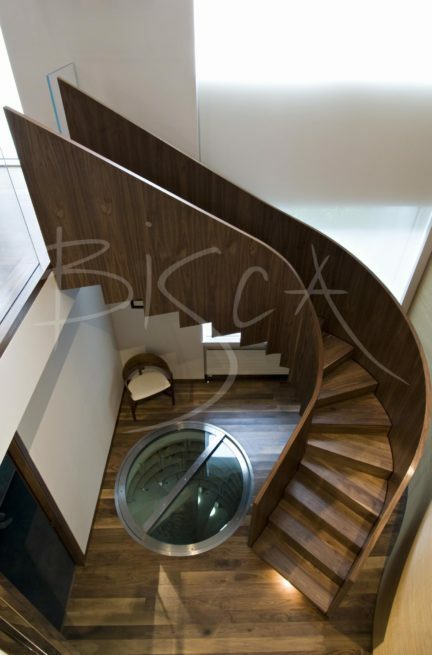 All Bisca designs are 100% bespoke which means you can have a veneer of your choice. Looks fantastic; very professional and helpful. I just want to say the two guys that did the installation were excellent. Very adaptable & tidy. A credit to you. Thoroughly great job from start to finish. Really enjoyed working with you. The end project is amazing too! The project has been a great experience from the beginning to the end. The staircase fits in the barn perfectly – we are delighted. Many thanks to everyone involved. Superb job. Extreme care taken and awesome attention to detail, as always. Very good attention to detail, very impressed, the craftsmen are professional and have great knowledge. Looks fantastic, very professional and helpful. Very well planned out and great craftsmanship. Great group of guys, very polite and amazing craftsmen – a credit to the company. Excellent work by the craftsmen. A big thank you to the Bisca team! One happy customer. We are completely thrilled with the finished masterpiece! Service from the initial meeting has been spot on. The installation team were great. The attention to detail is absolutely fantastic and we are so pleased we chose Bisca. Thank you! The skill and experience of our workforce is a very important element when it comes to satisfied customers. © 2019 Bisca Staircases. All Rights Reserved.